Proper maintenance involves conducting bi-annual cleanings/inspections. These inspections/gutter cleanings are performed before and after every winter. It is also advisable to perform additional roof inspections after periods of severe weather. Before any roof maintenance program is begun it is necessary to verify that the attic is properly ventilated. Such an oversight can only lead to unnecessarily premature damage to you roofing system. This inspection should always be performed by a licensed professional roofing contractor that is experienced with your roofing material of choice. Clean gutters and down spouts. On Shingle roofs inspect for signs of shingle deterioration. On Slate roofs look for missing or damaged slates. Inspect all flashings for signs of failure. 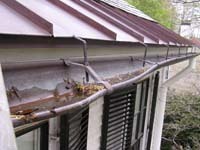 Identify any branches that touch or overhang the roof for removal. Triple M Contracting provides a yearly roof maintenance program. This maintenance program is a special benefit for slate roof customers. Not only can you rest assured that TMC will perform all cleanings and inspections without foolishly walking across your slate roof as other less reputable contractors might. While performing the inspection of your slate roof we will replace up to 5 missing or damaged slates at the time of inspection with our stock of matching color and weathered replacement slates @ an additional cost of $25 to $45 a slate depending upon size and color. This convenience not only takes care of the problem quickly, it also avoids our $225 minimum for slate replacement service visits.